Millennia have passed on Arrakis, and the once-desert planet is green with life. Leto Atreides, the son of the world’s savior, the Emperor Paul Muad’Dib, is still alive but far from human. To preserve humanity’s future, he sacrificed his own by merging with a sandworm, granting him near immortality as God Emperor of Dune for the past thirty-five hundred years. 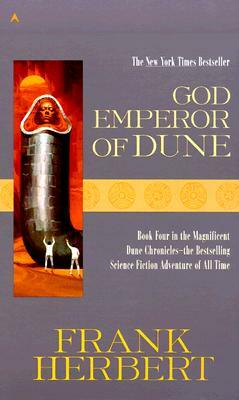 Frank Herbert is the bestselling author of the Dune saga. He was born in Tacoma, Washington, and educated at the University of Washington, Seattle. He worked a wide variety of jobs—including TV cameraman, radio commentator, oyster diver, jungle survival instructor, lay analyst, creative writing teacher, reporter and editor of several West Coast newspapers—before becoming a full-time writer. In 1952, Herbert began publishing science fiction with “Looking for Something?” in Startling Stories. But his emergence as a writer of major stature did not occur until 1965, with the publication of Dune. Dune Messiah, Children of Dune, God Emperor of Dune, Heretics of Dune, and Chapterhouse: Dune followed, completing the saga that the Chicago Tribune would call “one of the monuments of modern science fiction.” Herbert is also the author of some twenty other books, including The White Plague, The Dosadi Experiment, and Destination: Void. He died in 1986.